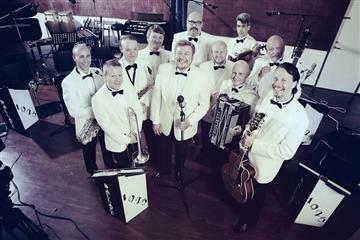 Dallapé, based in Helsinki since 1925, is a Finnish entertainment orchestra. During the past 90 years, Dallapé orchestra has played a significant role in Finnish cultural history. In the early years the Dallapé music was influenced by the strong western rhythm and swing music however on the other hand one can hear melancholic Slavonic motives from the east. It is from these east-west elements that Dallapé created its very own swing sound. Generations have changed but Dallapé orchestra is still going strong. Dallapé has entertained over the decades and it is sounding today better than ever. Many of the musicians who are part of the Dallapé orchestra are internationally recognized musicians as well as highly respected artist in Finland. Dallapé´s songs are the cross-section of the entire history of Finland and its identity. For good reason we can say that Dallapé´s compelling rhythms are real Finnish "folk music".